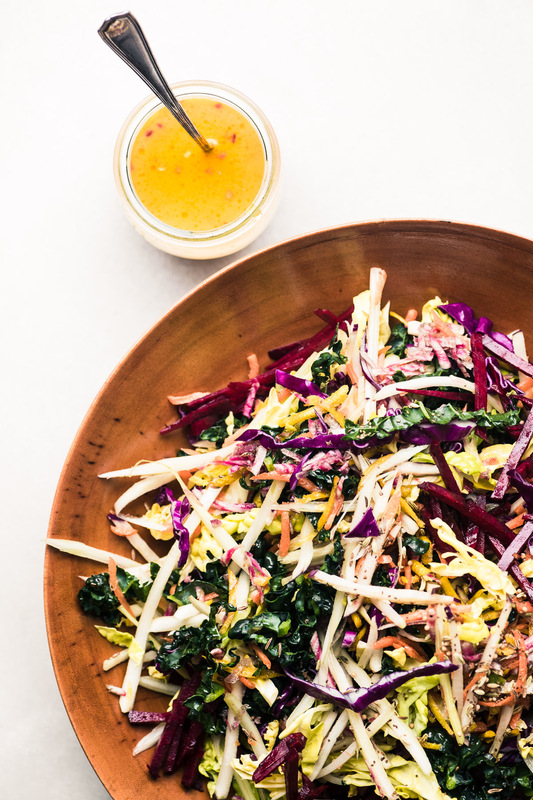 Vibrant Winter Slaw with Citrus Vinaigrette ~ I love a great slaw any time of the year, but there’s a special place in my heart for this root veggie salad that brightens up my winter menu with a blast of color and an epic crunch! 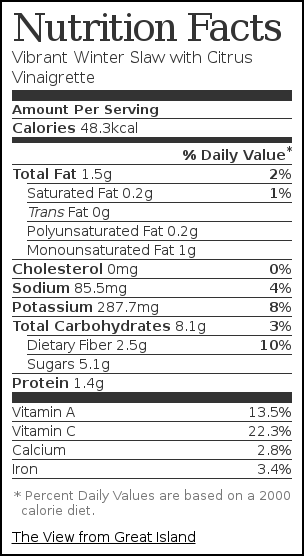 It’s low calorie, packed with vitamins, minerals, and lots of fiber. If you’re craving color and crunch in your meals lately, I’ve got just the thing for you. It’s bright and cheerful, easy to put together, and gives you an opportunity to try some of those winter veggies you might pass up at the supermarket . There’s no cooking involved, just peel and shred. 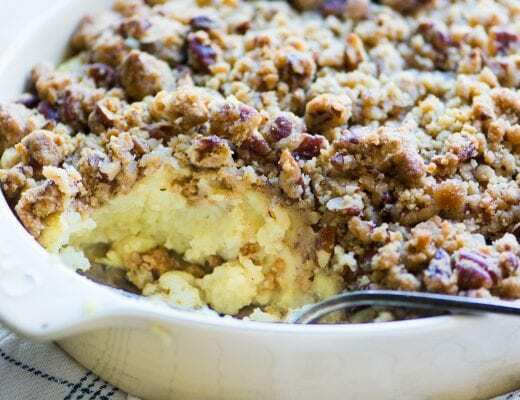 Spoon this alongside meatloaf, roasted pork or chicken, or any type of fish. Pack up the leftovers for lunch. Slaws generally keep their texture and crispness longer than regular salads because they’re made with sturdy cabbage, and in this case, kale, too. Those greens aren’t as delicate as lettuce, and won’t wilt. 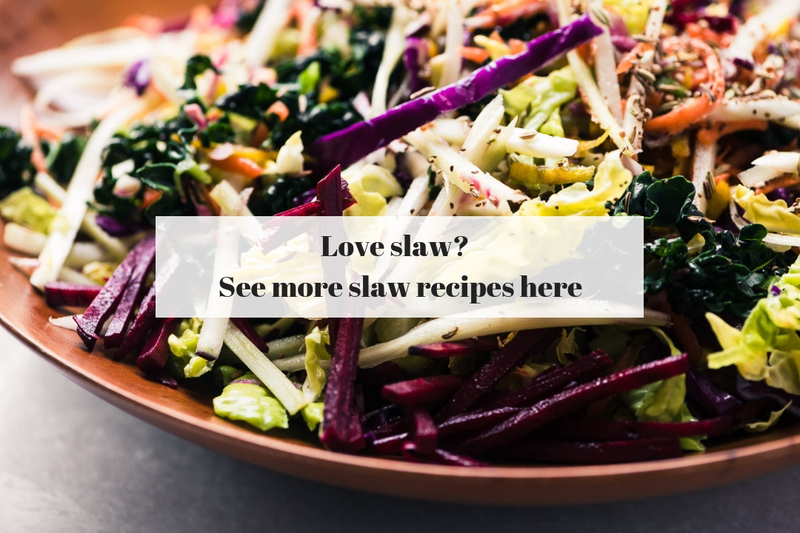 You can safely dress this slaw and leave it overnight, it will even hold up ok for a couple more days, as long as you don’t shred your veggies too finely. A trip to our farmers market inspired this salad. I know we’re not all equally blessed with year round produce markets, and since I’m in Los Angeles where the farmers markets go all year long, I feel compelled to haul myself out of bed early on Sundays and take advantage. I don’t think I’ve ever bought more in a single visit than I did last week ~ winter veggies are heavy! 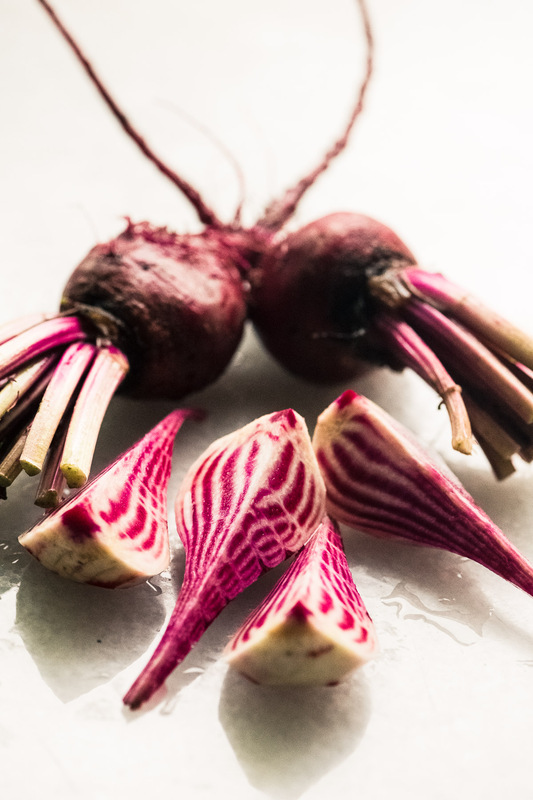 Winter veggies can be just as colorful and vibrant as summer produce, it just takes a little more imagination…peel and slice Chioggia beets to reveal their gorgeousness. TIP: When I use red beets I find it helpful to toss the shreds lightly in olive oil first, and add them at the last minute to the slaw. This helps keep them from turning everything pink. The thing that separates a slaw from a salad is the shredding. 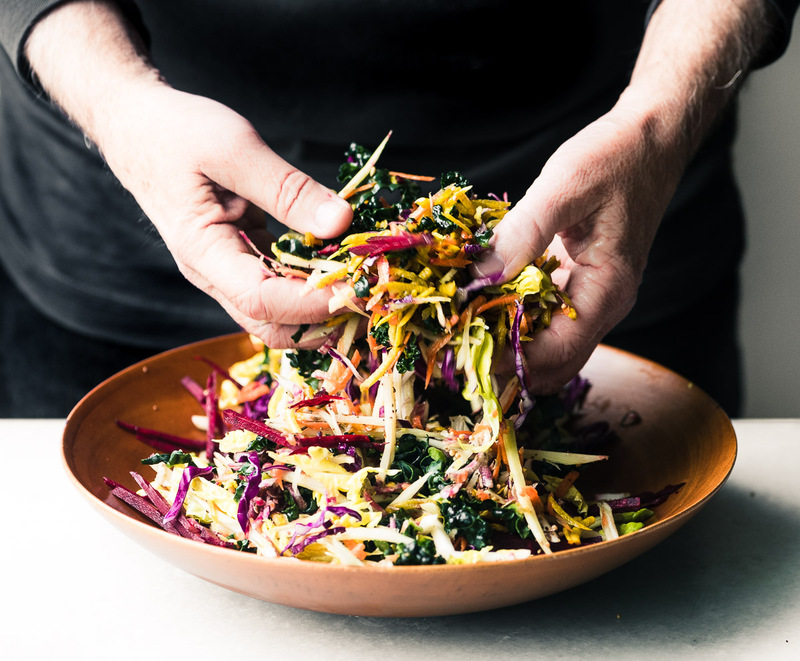 There are a few ways you can shred your slaw…when it comes to cabbage you can slice it very thinly with a large sharp knife and then cut it into shreds. But for really dense vegetables like beets you’ll need to use either a food processor with a shredding disk, or a mandoline that has the shred setting. The mandoline slicer is my choice because the shreds are even and a little thicker than you get from a food processor or a box grater. Just be sure to use the protective guard, especially with hard veggies like beets. 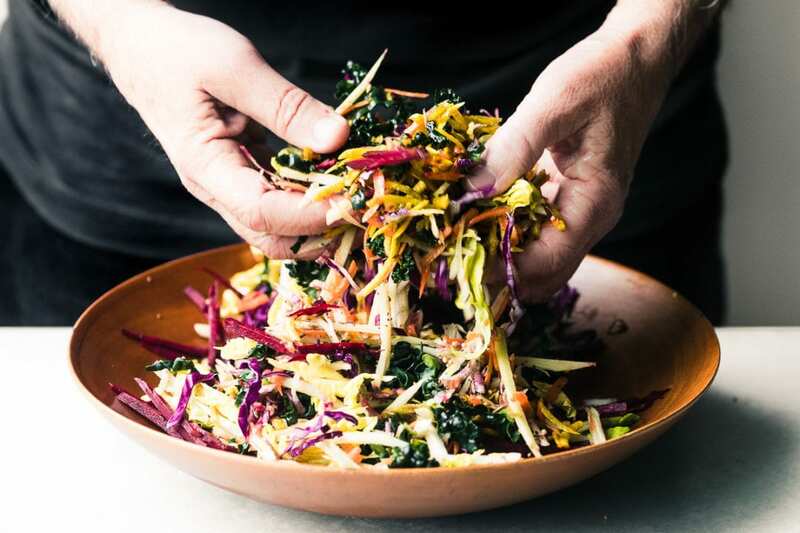 TIP: It’s essential that your shredded veggies are completely dry or your slaw will be soggy. 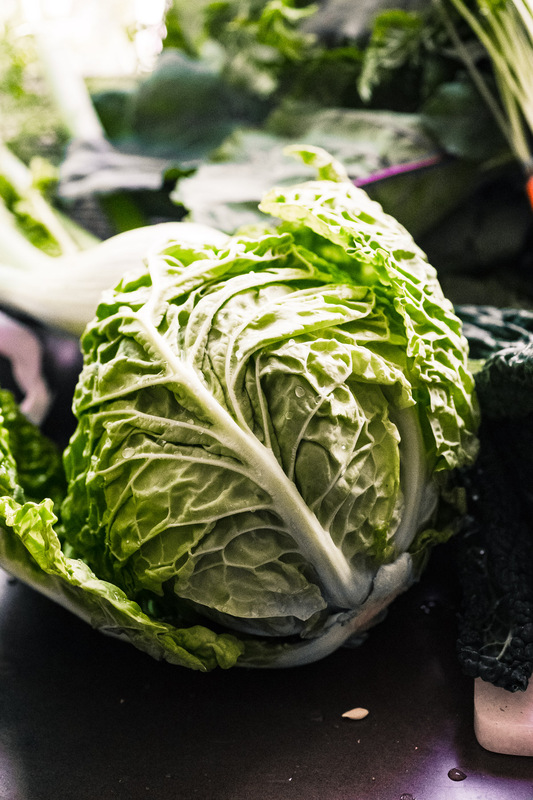 If you wash your cabbage and the shreds are dripping, dry them on an absorbent kitchen towel before adding them to the bowl. 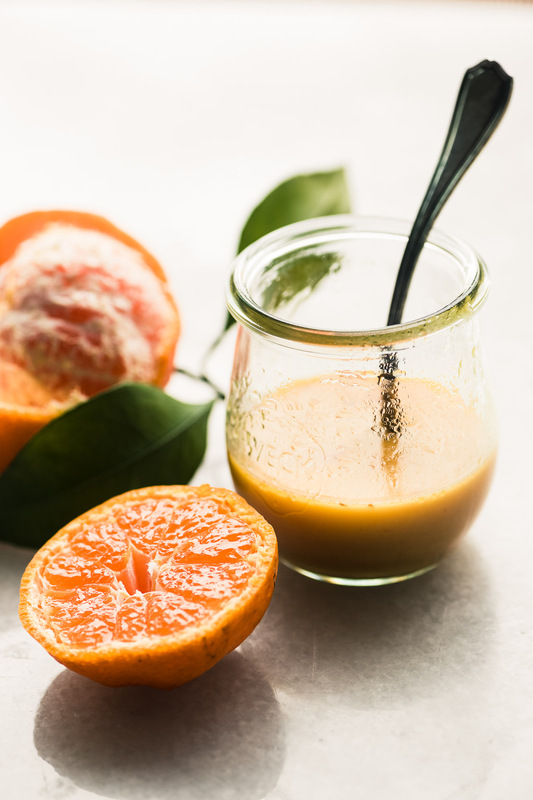 And I couldn’t leave winter citrus out of this recipe, so it became a bright vinaigrette. Use any citrus fruit you like, I had juicy tangerines. I also added a few spices to my slaw ~ a tiny bit of fennel, caraway, mustard, and celery seeds. They add a nice complexity to the salad and give it a subtle Eastern European vibe. 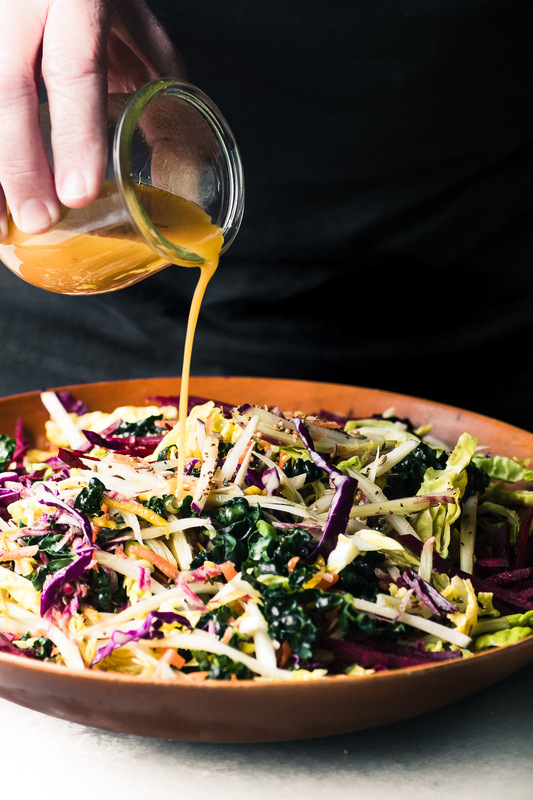 Vibrant Winter Slaw with Citrus Vinaigrette ~ a healthy high fiber side dish salad that brightens up any menu. Toss the shredded veggies and seeds together in a large bowl and add enough dressing to moisten. You can refrigerate the slaw several hours before serving if you'd like. Season with salt and pepper and add more dressing to taste just before serving. 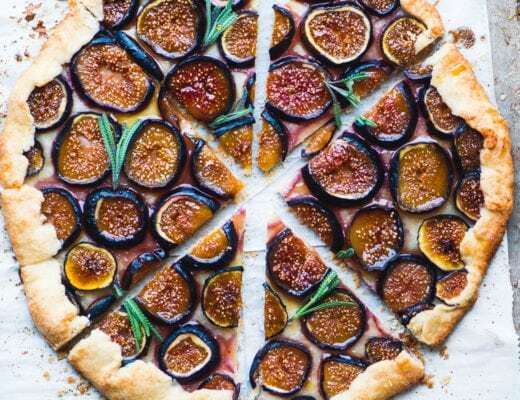 I gave ingredient amounts here but please don't let them box you in...you can add the various veggies in any amounts or combinations you like, this is just a suggestion. You don’t have to use such a wide variety of veggies like I did, sometimes less is more, and I love the combo of beet and fennel, for instance. A classic creamy slaw dressing would work too: whisk together 1/2 cup mayo, 2 Tbsp sour cream, a little grated onion, 1 Tbsp white vinegar, sugar to taste (start with 1 tsp) 1 tsp dry mustard, 1 tsp celery seed, salt and pepper to taste. Thin down with a little milk if necessary. Taste and adjust anything that needs it. So vibrant and I love the citrus vinaigrette! 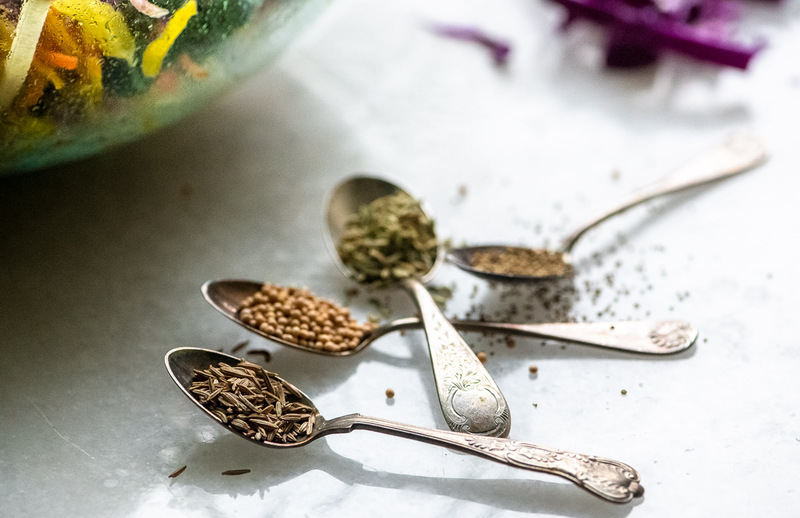 I was hoping for some insight about amounts and handling of the suggested 4 seeds to season….Do you crush them in a coffee bean blender or smash them in a mortar, or….And for the amount of liquid in this dressing recipe, would you start with 1/2 teaspoon each? Does the Dijon work with these seeds? I realized I didn’t put the seeds in the recipe, they’re there now. I just did 1/4 tsp each, I didn’t want an overpowering flavor, but you could add more. And I just add them whole, I love crunching down on the occasional seed and getting that burst of flavor. Thanks, Sue! I made your salad and dressing with just a few changes….I used only gold beet (no chioggia in sight), and instead of kohlrabi I used jicama – which rocked! I also added endive, which is so sweet this time of year! My vinegar was raspberry champagne and it was so good with the tangerine juice-based dressing! I coarsely pounded 1/2 tsp of each of the seeds – I didn’t see your suggested amounts until today…it is so delicious and complex in flavor. I got rave reviews for the Winter Salad and fed 7 hungry adults, who love salad…. so *applause* to you! 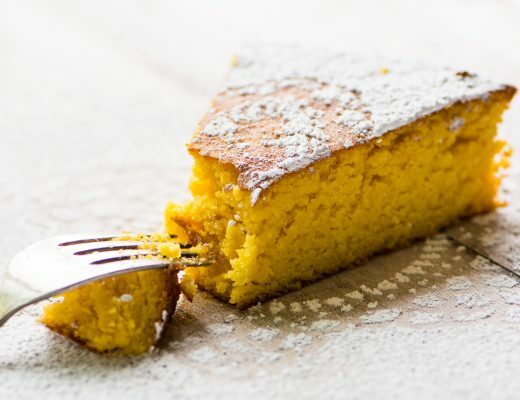 this recipe looks so wonderful and so gooooooooooooooooood. I wish I could make it. I live in Lawton, Oklahoma. Unfortunately no stores here carry any of these vegetables. I am lucky if I can get fresh bread once in a while. Sharyn I’m shocked that you can’t get these vegetables, what a shame. Somebody needs to fix that. I just read all about your beautiful town (on Wikipedia lol) and stumbled across the Oklahoma Farm and Food Alliance that seems to be a great resource for local fresh produce, and I found another great resource that lists farmers markets, farms, and stores that sell local produce, here, don’t know if there is anything useful there for you. Beautiful, healthy and delicious…a perfect winter salad, Sue. Thanks Angie ~ gotta keep those salads going through the yucky weather! This couldn’t be more perfect Sue! I’m all about the epic crunch and loads of color and flavor. What a great addition to my winter line-up. We love comfort food for sure, but a little crunchy, healthy lift to the menu is a great thing! Thanks – PINNED! Oh This looks lovely! Very beautiful pictures too (as always!). I adore salads like that and makes them often, especially in winter where I crave all the crunch and vitamins.